ContempConvos: Why is the YA Thriller/Spy genre underrated and underdeveloped? Disclaimer: So this past weekend was my birthday and I may have taken a day or two off. Sorry guys! But here is a discussion post that will make up for my silence this weekend! And yes, I am now 25. SAY WHAT?! It is time I talk about a very important topic… and that important topic is Why is the YA Thriller/Spy genre underrated and underdeveloped? In other words, Why is it not as BIG as other YA sub-genres? Think about this. You walk into a bookstore and beeline directly to the YA section. You see YA fantasy, YA paranormal, YA contemporary, YA dystopian, etc., but you don’t see a special section dedicated to the YA thriller/spy novels. Why is that? First, we all know that there aren’t many YA spy/thriller novels out there to begin with. If we think long and hard about YA authors writing books for this specific sub-genre, there aren’t many. We have Jennifer Lynn Barnes, Ally Carter, Abby McDonald, and Lauren Oliver. But if you try to think even harder, you may come up empty-handed like I do. I’m a big fan of the spy/thriller genre. I love me a good spy/con-man story that has you constantly at the edge of your seat. And the thing is those novels are not badly written, they are good, but why are they not as big as others from other sub-genres? It just makes me sad that not many authors explore this sub-genre as much and that might be part of the problem. There are only a few household names when we think of the Thriller/Spy sub-genre. I personally think it is because not many people want to take the risk of writing a thriller/spy/con man novel without the paranormal or fantasy element. It is much easier to go down the route many have gone than one that many have not passed through. What are your thoughts? Do you agree or disagree with me? Are there more YA thriller/spy novels out there that I haven’t discovered yet? Talk to me! I want to know what you guys think! Bayport High operates like any other high school–jocks at the top, outsiders at the bottom, and everyone else in between. Enter Toby Klein, a sophomore computer hacker who doesn’t play well with others. She has zero school spirit, a black belt in karate, and what her guidance counselor calls an attitude problem. She’s the last person you’d expect to be invited to join the varsity cheerleading squad. But things are different at Bayport. Bayport’s varsity cheer squad is made up of the hottest of the hot. But this A-list is dangerous in more ways than one. The Squad is actually a cover for the most highly trained group of underage government operatives the United States has ever assembled. Athletically, they’re unmatchable, though they make it all look easy on the field. Mentally, they’re exceptional–but with one flash of their gorgeous smiles, you’ll completely forget that. Socially, they’re gifted, so they can command and manipulate any situation. And above all, they have the perfect cover, because, beyond herkies and highlights, no one expects anything from a cheerleader. Toby Klein might not seem like the most likely recruit, but she’s never been one to turn down a challenge. If she can handle the makeover, Bayport Hight may just have found its newest cheerleader. 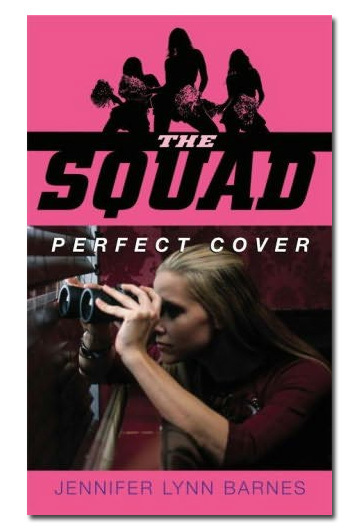 Pretty, popular, armed, and extremely dangerous–meet THE SQUAD. The first time I tried to read this book I was like, “NO… NO… Why did I buy this book again? !” I put it down for about 2-3 weeks and decided to give it a second chance a few days ago. Boy was I happy I did because it just became one of my favorite books of 2013. It is fun to read, it is witty, it has great, strong female characters, and it is action packed. It made me look at a cheerleader in a whole new way. Even though I had a lot of work to do, I still managed to finish this book in one day. Talk about accomplishment right there. I recommend this book to anyone that is stressed out. Get past the first two chapters and you’re going to thank me I told you to read it. Go on now.. GO BUY IT! If you want to know more about the book and discuss it with me, leave a comment below! I’m all for talking about it!